Rumi comes with the strong background and experience of having worked for both the corporates as well as the development sector since 1993. 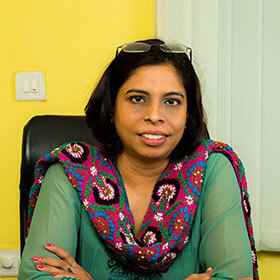 She holds a Post-graduate degree in Sericulture from Bangalore University and Entrepreneurship Development program from IIM Bangalore and currently pursuing her Ph.D. Rumi has worked with organizations like Dr Reddy’s foundation (DRF), Sense International (UK), Centre for Environment Education (Ahmedabad), and The Action Research Unit (TARU). In 2005 she went on to set up Ants Consulting & Services Pvt. Ltd, with a strong vision to take up skill development and employment generation for the youth in India. As a Social Entrepreneur she has raised funds, implemented large projects and brings in the immense know-how of entrepreneurship development and enterprise creation. She is also the founder member of SAFAL (Skills Academy for Appropriate Livelihoods), an NGO, which works in the domain of Livelihoods and Sustainable development. OVERALL OPERATIONS, BUSINESS DEVELOPMENT, HR/ADMIN, MARKETING.